Looking for a perfect little cabin for a Pigeon Forge honeymoon or anniversary? Don’t miss Alone at Last, a 1-bedroom cabin with plenty of space, relaxing amenities, and a semi-private atmosphere surrounded by the Smoky Mountain trees. What makes Alone at Last great for couples? 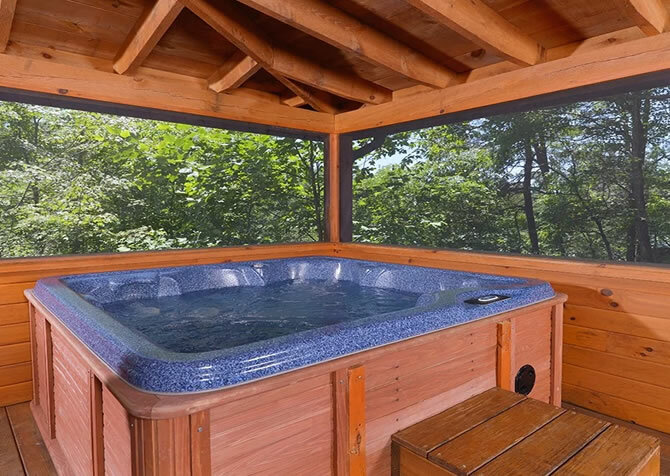 How about the outdoor hot tub, indoor jetted tub, and walk-in sauna? Or the wraparound porch that offers multiple rocking chairs and seasonal views of the Smokies? Turn this charming cabin into your family’s favorite vacation rental with its additional sleepers for room for up to 4 guests. Your kids will also love the upstairs loft with its arcade system, PlayStation, and separate TV. With its warmly decorated interior, spacious room sizes, and bonus amenities, Alone at Last has just what you need for your next romantic getaway or fun vacation! Alone at Last also provides easy access to your favorite Pigeon Forge attractions—downtown is less than 9 miles away—and to the Great Smoky Mountains National Park. 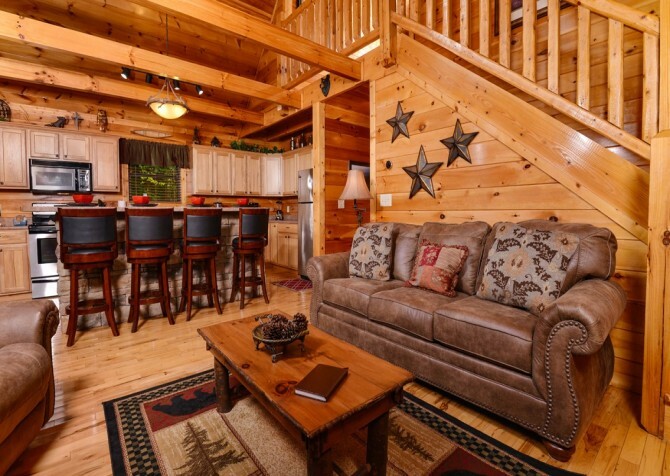 But if you’re looking for a cabin that can hold a few more than 2, Alone at Last is still a great choice. During the day, be sure to spend some time in downtown Pigeon Forge, perusing the Parkway for a delicious Southern-style restaurant or going back in time for a fascinating tour of the RMS Titanic at the Titanic Museum Attraction. And to make your sightseeing easy and affordable, the City of Pigeon Forge offers the Fun Time Trolley! 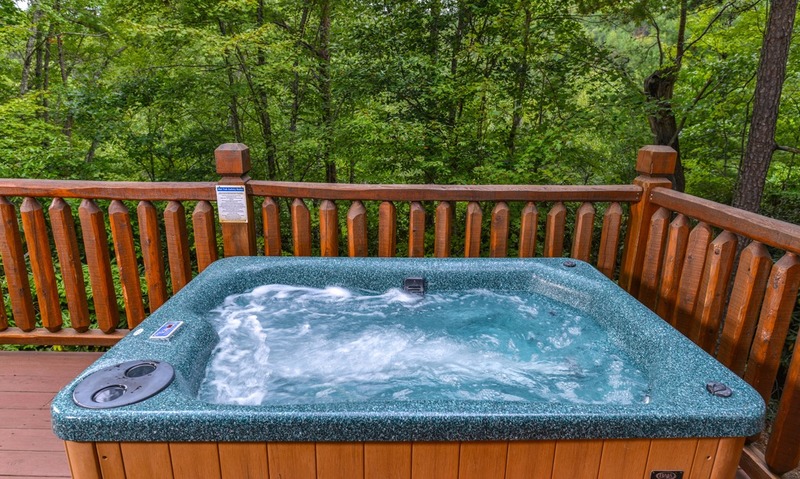 Save yourself gas and the headache of navigating unfamiliar streets before heading back to Alone at Last for a quiet night amid the Smoky Mountain trees. 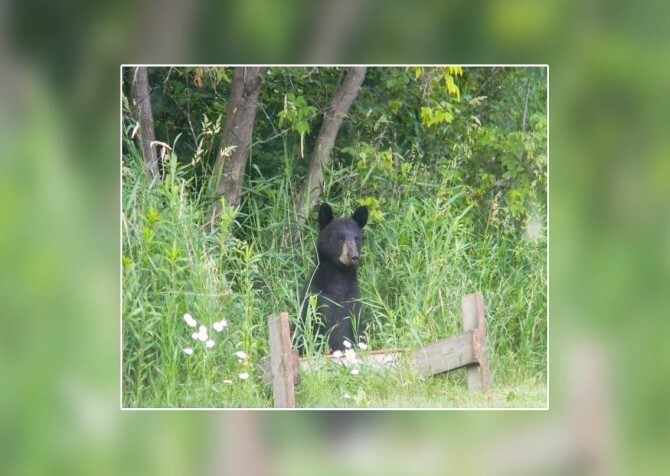 You’ll love the wooded, semi-private lot provided by Alone at Last, especially if you’re honeymooning and hoping for some privacy. 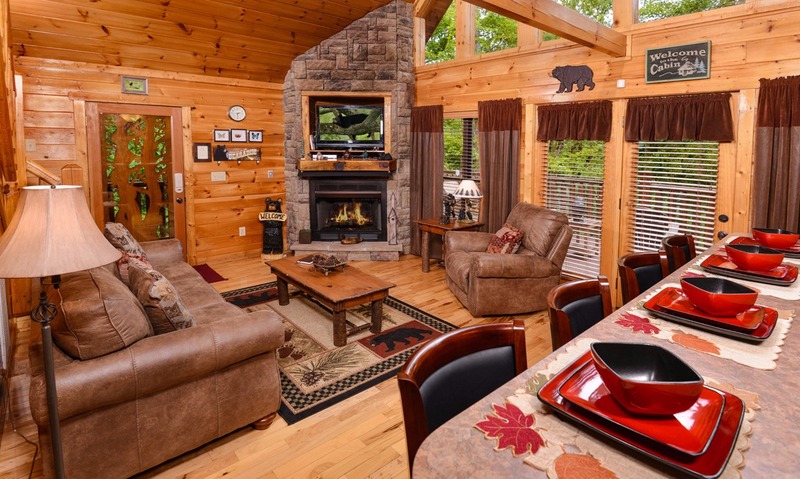 And this wooded view can be enjoyed even from this cabin’s large living room! 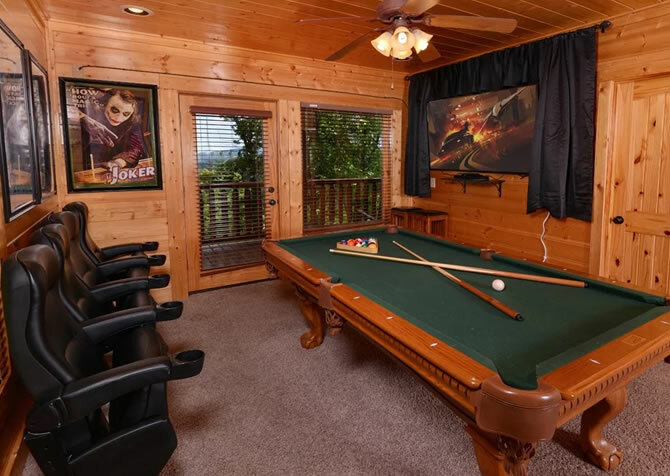 The back wall is covered with large windows from floor-to-ceiling, providing natural light throughout the day and even distant mountain views for those visiting the Smokies in the winter. Besides the warm natural light, this living room is warmly decorated with rich brown and red tones. The leather couch, area rug, and oversized chair all complement each other in style, and the focal point of the room is the gas fireplace in the corner (seasonal use only) that’s surrounded by large stones all the way to the ceiling. Watch your favorite show on the big screen TV, play a DVD, or relax with a book in front of the fireplace during your Pigeon Forge stay at Alone at Last. 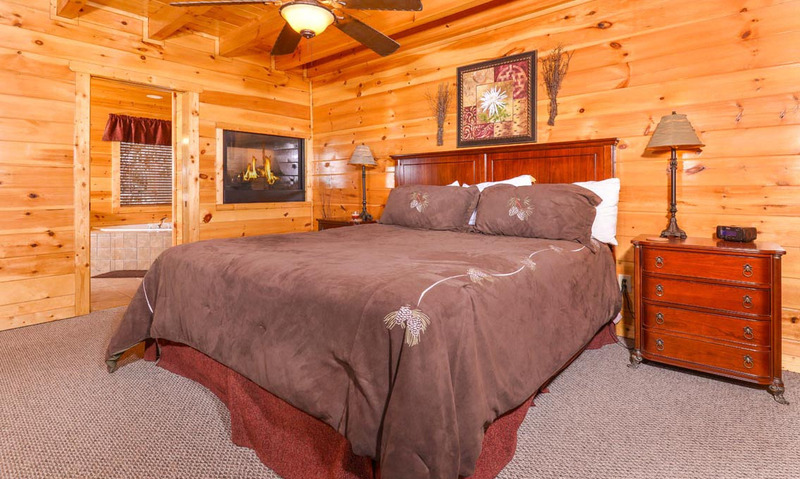 There are so many ways to spend a romantic afternoon or evening as a couple in Pigeon Forge. 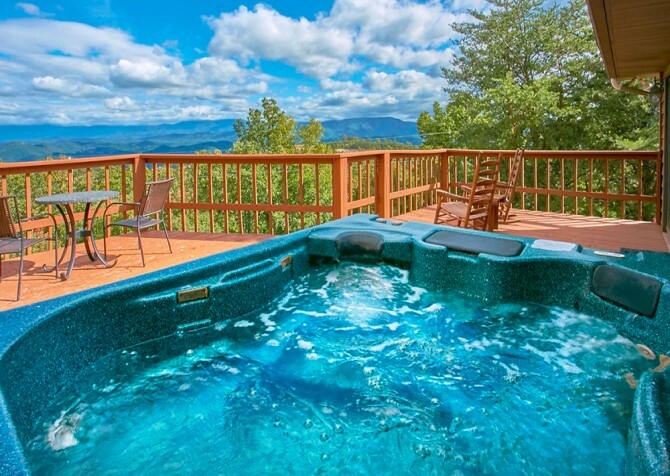 Try a horseback riding through the Great Smoky Mountains, a dinner show on the Parkway, or even a romantic in-cabin massage for two. Ask our reservation specialists for more information about adding a massage, in-cabin chef, and/or romantic gift basket to your Cabins for YOU experience. But one of the easiest ways to make memories is to cook together in your fully equipped kitchen! 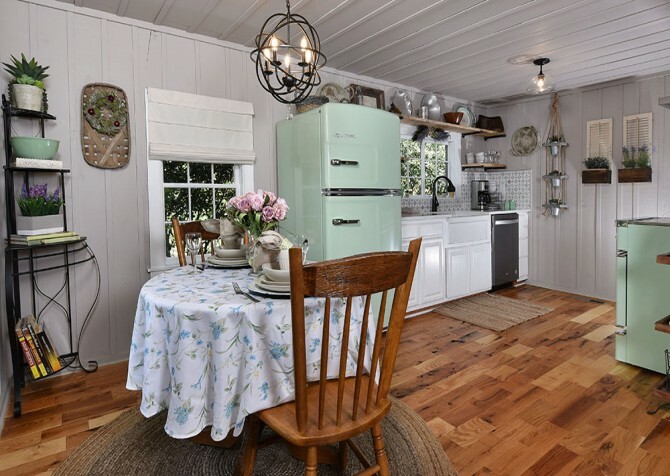 Feel free to use your black-and-stainless-steel oven/electric stove to make breakfast in bed or use the charcoal grill on the deck for a delicious steak dinner. Alone at Last also provides ample counter space, a full-size fridge, a coffeemaker, and a dishwasher. To make dining easy, Alone at Last offers a 4-piece breakfast bar that’s conveniently attached to the kitchen. This is a great spot to enjoy a quiet meal together because you’ll be surrounded by large windows that overlook the trees and in view of the big screen TV in the corner of the living room. If you don’t want to eat at the bar, the open-concept layout of Alone at Last means you can relax on the couch while resting drinks and plates on the coffee table in front of you. No matter where you end up, you’ll love the privacy of eating together inside Alone at Last. The upstairs loft inside Alone at Last is a special feature of this 1-bedroom cabin. That’s because you’ll not only find extra sleeping space inside this room (including a sleeper sofa), but also an arcade system, PlayStation, and extra TV. Besides all this, Alone at Last offers a much-needed amenity for those wanting to de-stress and relax during their Pigeon Forge getaway: a walk-in sauna! 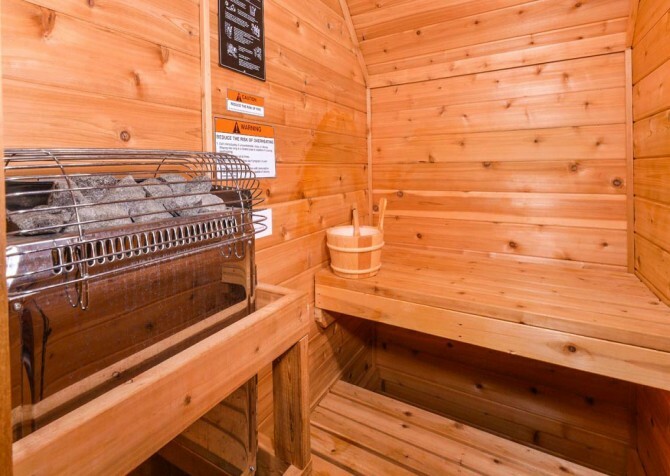 Change into your swimsuit and let the warm, relaxing sauna melt your worries away—whether that’s post-wedding stress or deadlines at work. 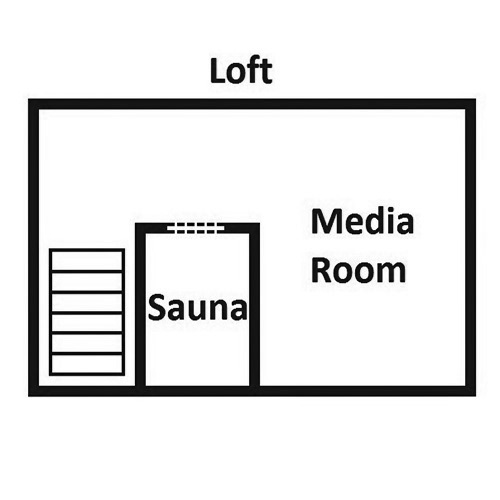 The large loft space also offers a love seat, which is perfect for catching up on a book or taking a cat nap on a rainy day. If you’re planning a Pigeon Forge stay for your honeymoon or any other special occasion for 2, then the master suite is the most important room of the cabin! Alone at Last doesn’t disappoint with its large, carpeted bedroom with warm décor, large windows, chair, flatscreen TV, and large, luxurious king-size bed. This room also provides plenty of storage with its large closet and drawer space. 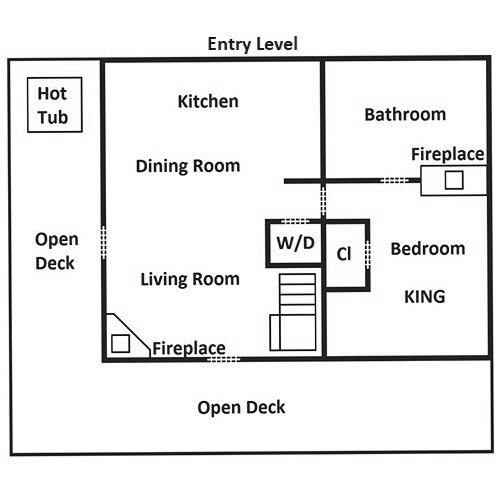 And to top off your master suite experience, enjoy a double-sided gas fireplace (seasonal use only), which can also be enjoyed from your en-suite bathroom. Relax in your indoor jetted tub while overlooking the trees and make the most of your Pigeon Forge getaway at Alone at Last! The outdoor spaces of Alone at Last can be enjoyed in any season. 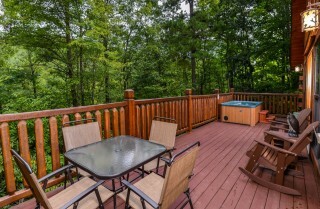 The wooded views are green and lush for spring and summer, switching to an array of reds, greens, and golds for fall. In the winter, enjoy distant views of the rolling mountains. All year long, enjoy Alone at Last’s outdoor amenities like its wraparound porch, rocking chairs, and outdoor hot tub. The porch is large enough to spread out and quiet enough for a cup of morning coffee without any nearby disturbances. Enjoy private time in the great outdoors during your family’s stay at this semi-private Pigeon Forge cabin. 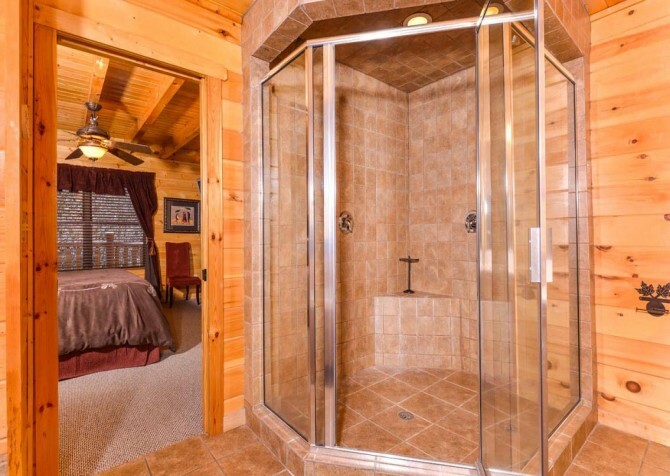 Alone at Last is a great choice for Pigeon Forge getaways because this cabin not only offers luxurious extras like a sauna and walk-in shower, but also convenient extras like a paved driveway, washer/dryer, and wireless internet. Use the internet to keep up with our Cabins for YOU blog while you’re away—we’ll tell you the latest places to see, foods to try, and events to catch. Finally, Alone at Last makes entertainment easy with its CD player, cable TV, and DVD player, all found within the cabin. Located just off Hatcher Mountain in beautiful Wears Valley, Tennesee, Alone at Last is the perfect place for your loved ones to escape the busyness of everyday life. Less than 5 miles from the Great Smoky Mountains National Park, you can plan for family bike rides or a lovely picnic during your stay. Choose from 3 unique mystery shows for an evening of hilarious comedy, curious mysteries, and delicious Southern-style food. Recently renovated, this dinner show is the place to go to see amazing feats of strength and skill as well as state-of-the-art stage effects that will wow everyone in your group. Celebrating 22 years, the Comedy Barn Theater continues to entertain families with clean comedy, country music, jugglers, magicians, ventriloquists, and more. 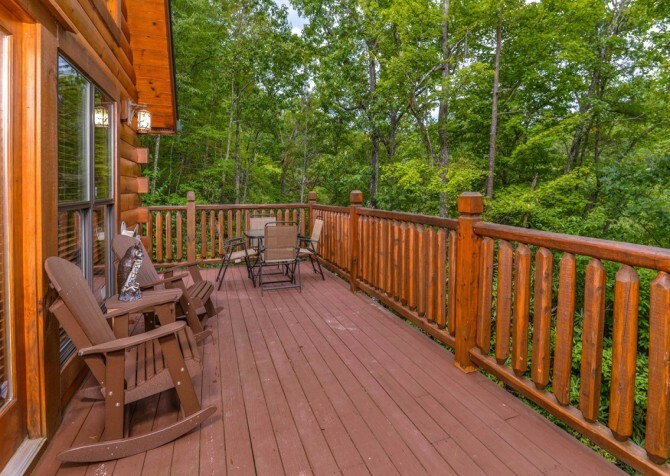 "My wife and I stayed at the Alone At Last cabin, because they offered us a military/veterans discount and the name was ironic as we were finally getting away from the kids. Everything was gorgeous, clean and very well maintained. We will for sure be coming back and booking the same cabin. Absolutely worth every penny and just an amazing experience!" "We recently stayed at Alone At Last and it was amazing. I always make sure to stay at a place with a fireplace, hot tub and I prefer it to be somewhat secluded. 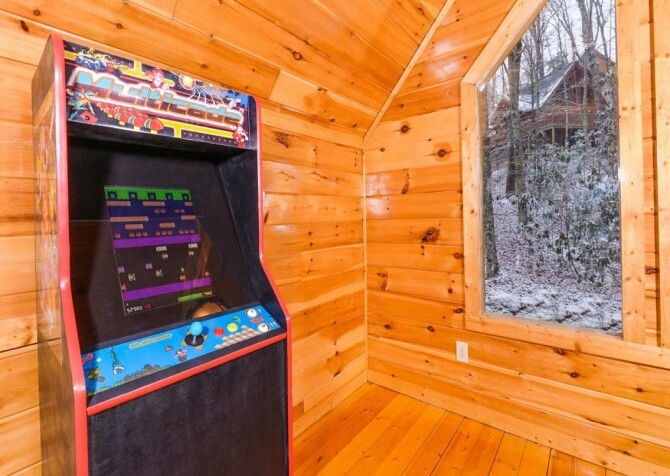 This cabin had all of that and more. There was a fireplace in the bedroom that also could be seen in the bathroom. 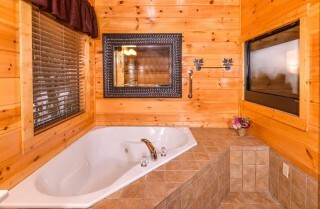 I got spoiled because I was able to take a bath in a huge jetted tub with a fire roaring. Then we would fall asleep each night by the fire. We had all kinds of little adventures planned for our stay in the mountains and ended up spending most of our time in the cabin. It was so quiet and peaceful there. 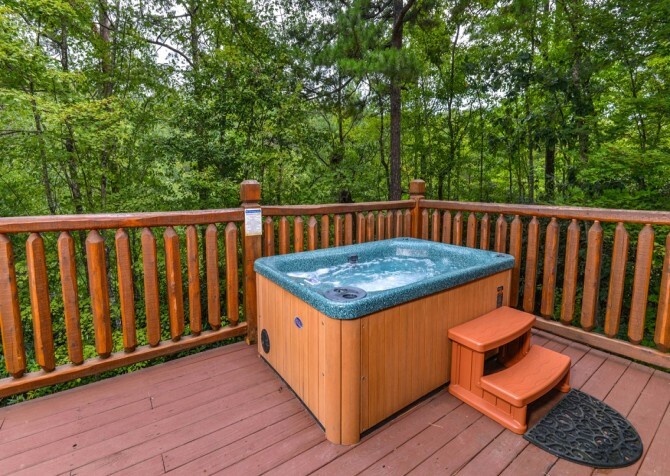 We would sit in the hot tub and just watch the leaves fall from the trees. Then we would head up to the loft and play Frogger on the arcade system. It was just what we needed and are already planning on staying at Alone At Last again next year." "Aboululey loved our stay at 'Alone At Last'. 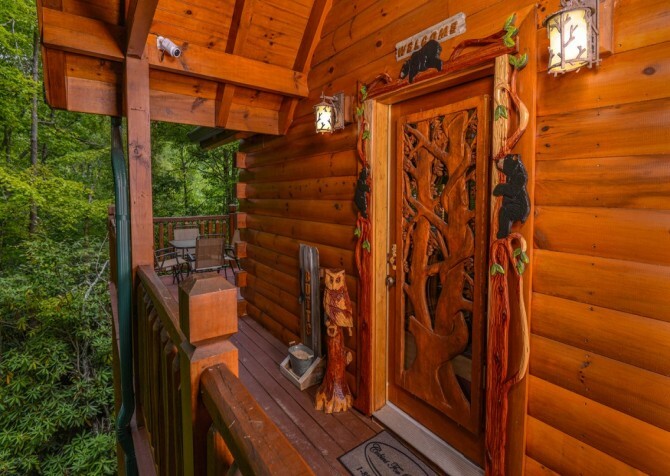 Very secluded cabin. 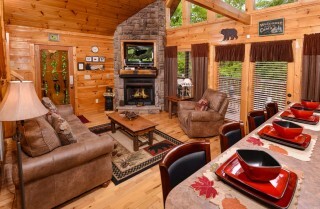 Deffiently going to choose this same cabin again on our next visit to Pigeon Forge. 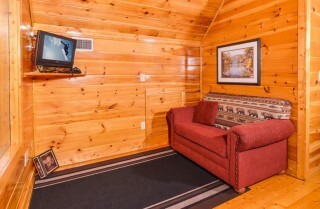 This cabin was even eqiuped with a washer & dryer so i didnt have to travel home with alot of dirty clothes. Really enjoyed the jacuzzi tub. 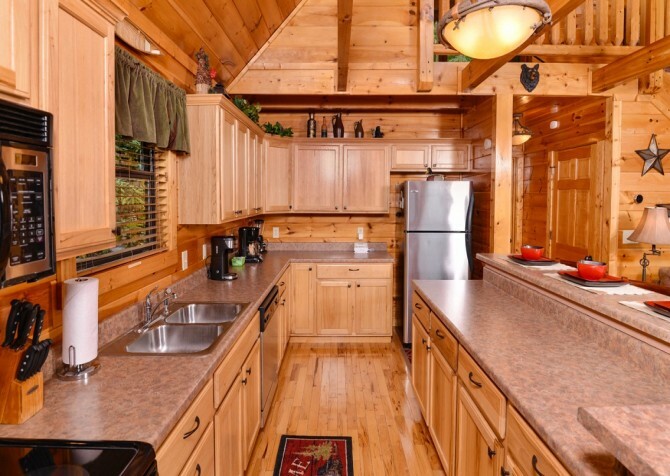 Im all about cleanliness and this cabin gets a 10/10 for cleanliness and organization!! 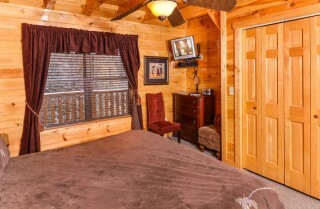 I love how this cabin was supplied with simple household things. Like hand soap, towels, toilet paper, paper towels, plates & utensils (and not cheap paper or plastic it was fancy dinnerware). 'Alone At Last' was a perfect getaway. Had 2 fireplaces! An arcade room! A sauna!!! Direct T.V. And even Wi-Fi hook up! 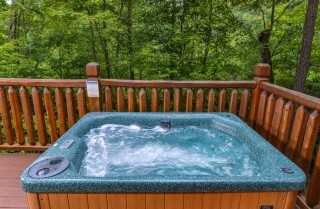 The hottub was located out on the balcony so we could relax and enjoy the beautiful scenery with no neighbors in site!!" "Had an awesome time starting 2018 staying in Alone At Last in Pigeon Forge Tenn. That cabin was amazing. It had so much to offer. Located at the end of the road so never had anyone drive by. 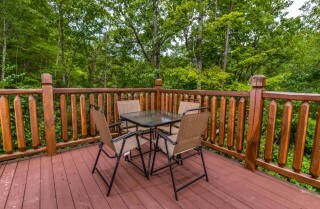 Located in a great spot, close to everything like Ober, Gatlinberg and downtown Pigeon Forge. 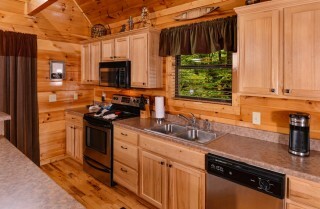 The cabin had a full kitchen with everything you need to cook and eat (pots, pans, plates and silverware) so we didn't have to eat out all of the time. Also had an arcade game and sauna upstairs so you can relax while the kids stay occupied. 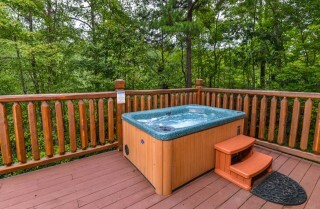 Enjoyed the hot tub on the deck outside, had a great view and very secluded. The cabin has wifi and direct tv which was a plus. The bathroom was awesome with it's huge shower with dual disco lighted shower heads and jacuzzi tub, that was next to a fireplace! Also there was a fireplace in the living room that kept us warm as we relaxed on the super comfy furniture. Alone At Last was by far the best cabin I have stayed in and will definitely be returning again and again." "We stayed in Alone At Last, and it was wonderful! Very clean, private, very quiet, comfortable furniture. It was the perfect getaway, and so conveniently located. We were at Dollywood, Paula Deens, Mill House, and all the main street attractions within 10-15 minutes. I loved the tree lined road up to the cabin! This city girl loved it!" "I recently rented Alone At Last through Cabins for You. I ABSOLUTELY LOVED the cabin. I also loved how easy Cabins for You made it to rent. I loved how clean it was and how fresh smelling when we walked in the door. The towels even smelled so clean. I’m going to go back soon. 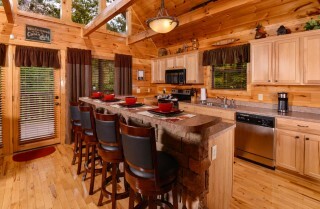 Thank you Cabins for You and thank you to the owners of Alone At Last!" 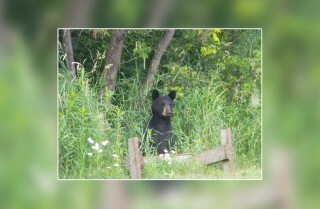 "I took my son and his friend on a mini vacation and stayed in the cabin Alone At Last. We absolutely LOVED the cabin, the location, and everything in between. Cabins for you was very helpful when it came to booking the cabin that best fit me and my needs. 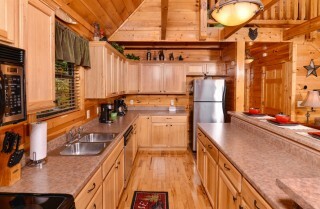 The cabin was very clean in appearance and smell as soon as we walking in the door for the first time. The kitchen and bathroom was nice, cleaned, stocked, and even the towels smelled so fresh and clean. 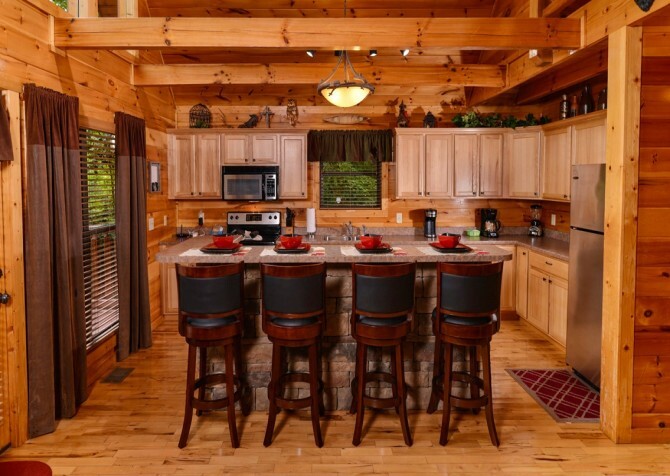 I’d recommend Alone At Last or any cabin you can choose using Cabins For You! Thank you Cabins For You! I will be going back and going through you." 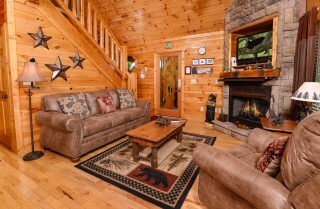 "We recommend Cabins for you for cabin rental needs. Their professional staff was remarkable. Thanks for your service and we'll be referring you to our family and friends. You were referred to us by a former customer, Anya Monique. Glad I took her advice. You didn't disappoint us. Your service was excellent and we'll be booking again."